VWC’s primary mission is to permanently protect Virginia’s most outstanding natural areas on our public lands through Wilderness or National Scenic Area designations. VWC has identified some of the finest remaining wild areas on the George Washington National Forest that are particularly deserving of protection. As reserves of biodiversity where natural processes are dominant, our special places have their own value, but they also provide important benefits to the public: clean water and air, recreational opportunities, and scenic beauty. VWC has nearly 50 years of successful Wilderness protection under our belt, and we are eager to move forward toward permanent protection for some of the last remaining special places on the forest. Both Wilderness and Scenic Area designations take an act of Congress, which is not easy, especially in today’s political climate. With increasing threats to our natural areas on the horizon, particularly from energy development, our work is critical, and we need broad public support to be successful. Rather than simply waiting for better circumstances, VWC has chosen an active course by reaching out to interest groups who ordinarily oppose Wilderness. The final GWNF plan made additional recommendations for Wilderness and a Scenic Area, largely due to the stakeholder collaborative. In 2010, VWC took the initiative to reach out to other forest stakeholders, including timber interests, wildlife managers and recreational groups, to see if we could work together to meet our very different goals. We believed that the 1.1 million-acre George Washington National Forest was large enough for us to collaborate, compromise, and find win-win solutions that balance preservation with management activities. This collaborative effort has already yielded some positive results. 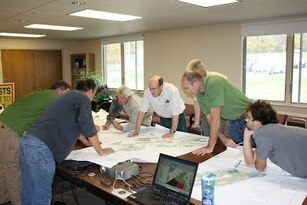 In October of 2011, fourteen organizations, including VWC, The Nature Conservancy, and timber and game interests, signed a joint set of comments asking the Forest Service to increase Wilderness and National Scenic Area recommendations in its new plan, along with an increase in management activities elsewhere on the forest. The GWNF responded by making a strong recommendation in the new plan for the Shenandoah Mountain National Scenic Area, adding to recommendations for Little River Wilderness and Ramseys Draft Wilderness addition that were already in the draft plan. 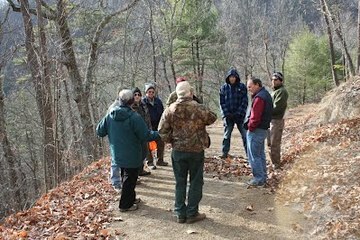 The plan also included a new recommendation for Beech Lick Knob Wilderness. The stakeholders are searching for a good balance between preservation of core areas and active management activities. Lower Cowpasture Project: Additions to Rich Hole Wilderness (5,000 acres) and Rough Mountain Wilderness (1,000 acres), creating a block of 20,000 acres of Wilderness separated only by a forest road. (Allegheny and Bath Counties) The Forest Service began planning for this project in 2013 and issued a final decision in December 2015. North Shenandoah Project: Beech Lick Knob Wilderness (6,200 acres) (Rockingham County) The Forest Service initiated planning for this project in March 2016. Greater Shenandoah Mountain Project: Shenandoah Mountain National Scenic Area and embedded Wilderness areas (90,000 acres) (Rockingham, Augusta, and Highland Counties). Planning for this project is a few years off; it will start when North Shenandoah is well on its way. In the mean time, VWC and Friends of Shenandoah Mountain are asking for endorsements and actively building public support for the Shenandoah Mountain Proposal through presentations to civic groups, exhibiting at events, and reaching out to neighboring landowners. Over the past 49 years, VWC has found strong allies to be essential for successful land protection. In today’s climate collaboration is the key to success. The Virginia Wilderness Committee is proud of its role in helping to initiate the George Washington National Forest Stakeholders Collaborative as a means to protect Virginia’s finest public lands, while meeting our partners’ compatible goals. Our main focus continues to be on protection of Virginia’s finest natural areas, and we believe this mutually beneficial approach will yield excellent results. Stay tuned for updates. VWC will be asking for support for the GWNF Stakeholder Collaborative projects at appropriate times for action and eventually for support for Wilderness and National Scenic Area legislation. We need YOUR help to be successful!